We see a lot of nice products, but many times they fail some tests for construction issues. It’s mostly due to the designers not knowing the requirements. 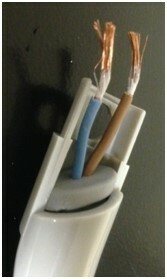 Most cord connected products must undergo a Strain Relief test. This test makes sure the design adequately keeps strain off the connection from the power supply cord to the internal circuits. You don’t want 120V flying around loose in a product! The picture below shows how to make the product pass the test. 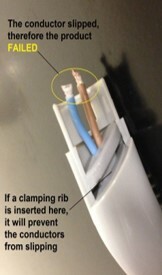 Compliance is achieved by incorporating a clamping rib to secure the conductors themselves, not just the insulation. The pictures below show both the before and after test of a product that failed. You can see we used White Out as an indicator. The product did provide a “bushing” and the bushing was adequately held in place, but the conductor moved inside the insulation. You can see the “After” picture shows a rib in the bushing slot. 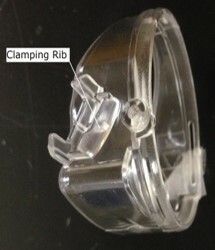 When the product is assembled, the rib is pushed into the bushing which is then pushed into the conductor’s insulation, clamping the actual conductor. The product passed with this design. Another means of passing would be to create a series of offsetting ribs to provide a torturous path for the cord inside the housing. Let Product Safety Consulting be your “Outsourced Compliance Department” to guide you through the safety certification process efficiently and cost effectively.